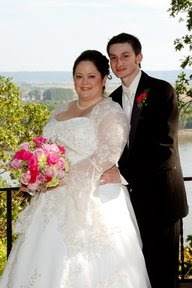 Here are some professional shots of two weddings that Sisters did this year. One was this past summer and the other was just last month. Take a look!! 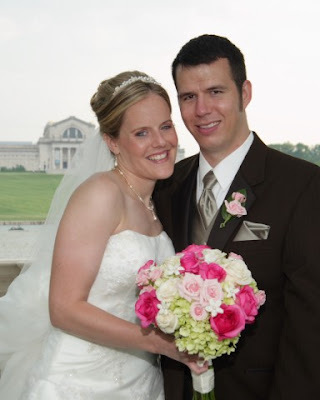 Sara and Aaron had a beautiful wedding ceremony and reception at the Butterfly House. All of the flowers were shades of bright and light pinks. 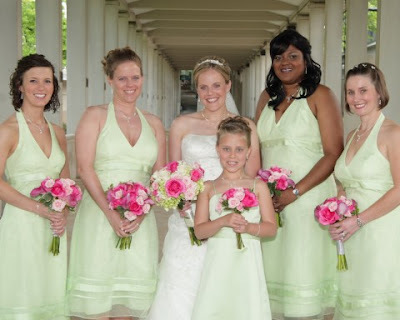 The bride carried bright pink and ivory roses, light pink spray roses, and green hydrangea. 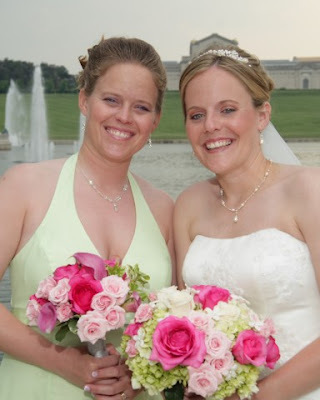 The bridesmaids carried the same bright pink roses and light pink spray roses with an accent of pink mini callas. And here are the guys. All dressed up and looking good!! 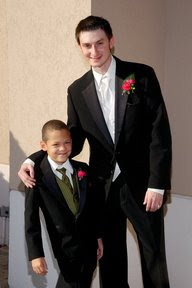 We have realized that perhaps we don’t feature the guys quite as much as we should. 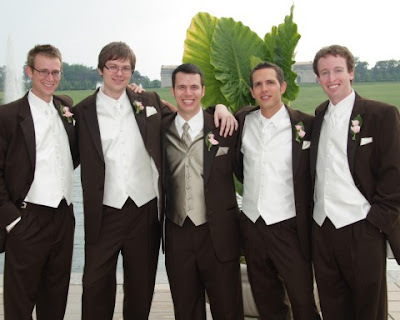 After all, as much as we girls focus on all of the details, there would be no wedding without the boys!! 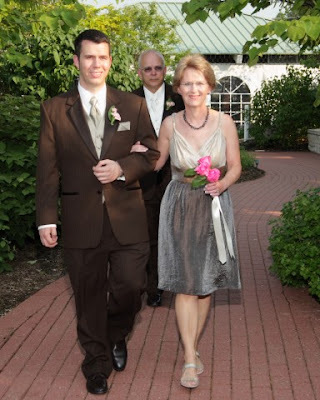 For the ceremony, we decorated the two large pillars on both sides of the bride and groom. 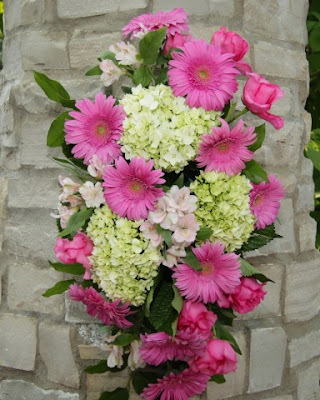 This arrangement includes all pinks and ivory to match the wedding party. The centerpieces at the reception were simple and elegant. 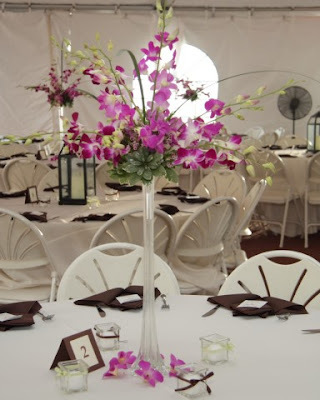 Bright dendrobium orchids and lily grass made a statement inside the tent. Ahh, yes–the cake. 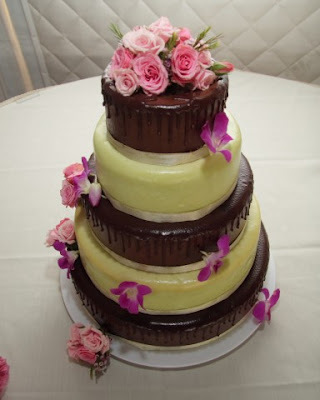 Wedding flowers were used to from clusters to decorate this delicious-looking masterpiece. We often say that cake is our second favorite detail at weddings!! This cute couple had a gorgeous fall day for their wedding. 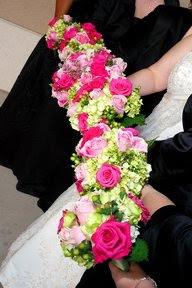 Shannda’s bouquet also had shades of pink roses and green hydrangea. 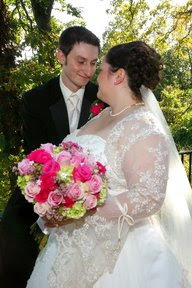 Bouquet jewels were an added detail to the bride and groom’s flowers. Another ode to the guys in the wedding party. Looking good! 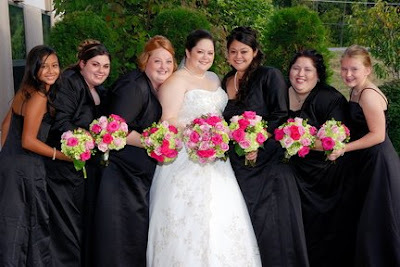 The bridesmaids’ bouquets really pop against their black dresses. The bridesmaids carried a smaller version of the bridal bouquet with added green hypericum berries for a very garden-y look. 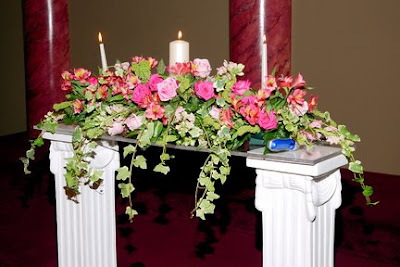 This long, low piece was used at the ceremony for the unity candle. It was made in three pieces, one large middle piece and two smaller side pieces. 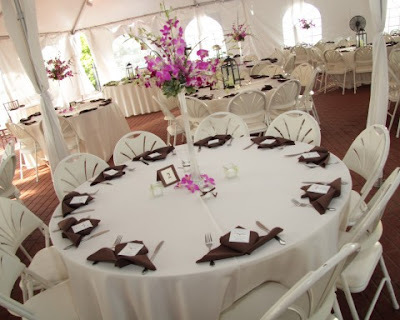 At the reception, it was used on the head table to decorate in front of the wedding party. 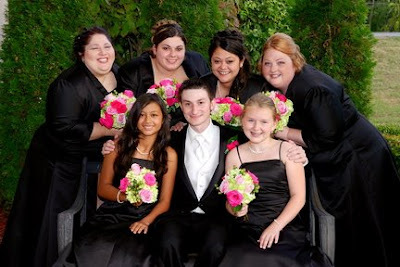 Thanks to two great couples who made us a part of their day and who shared their pictures with us. Best wishes in your new lives together! !